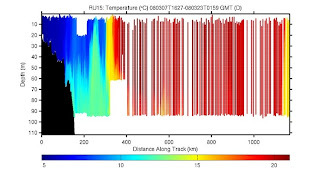 The 15C temperatures (yellow, on the right in the above section) mark the north wall of the Gulf Stream. You hit 15 C, and you crossed the line. You are now in the Slope Sea. 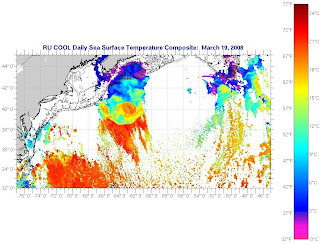 Sea surface temperature image form March 19 still the best. Right around 63W -62W, the Stream is heading nearly due east, and the is a perfect Warm Core Ring to the north. Thats were we'll head. 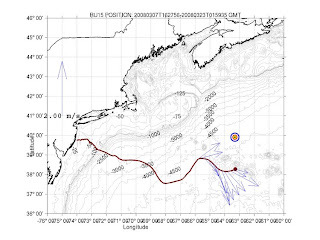 Here we use the slow glider speed to fly perpendicular to the current and swim us out of the Gulf Stream as the Stream pulls us to the east. 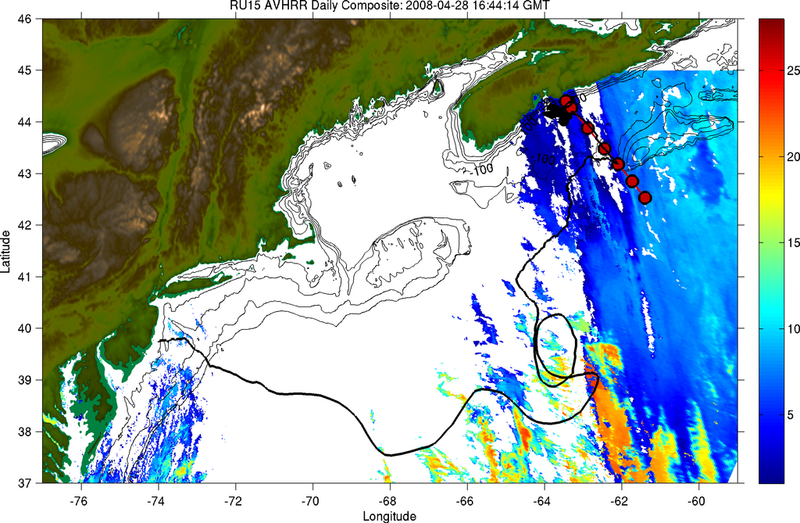 The velocities drop rapidly as soon as we cross out of the Gulf Stream and into the 15C Slope water. We'll continue heading north, likely with currents running slowly to the east till we hit about 39N. At that point we'll start seeing the switch in direction. As we enter the clockwise rotation of the warm core ring, the currents will pick up heading towards the west, and will sweep us around to the north. Our target here is the warm water heading towards the shelf break. If we can keep the glider temperatures near 15C, we'll be getting good currents. 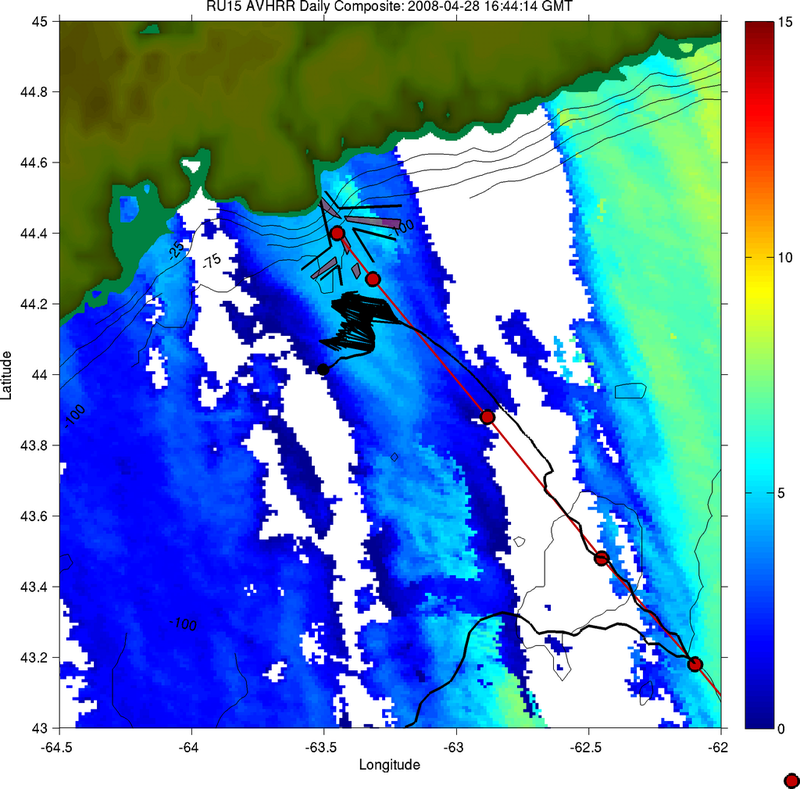 If the temperature drops down to the 6C-9C range, we are in shelf water thats flowing against us. A nice day of work at sea. We are currently at 63 16.87W longitude. Our target was to leave the Stream somewhere between 63 30 W, and 63 00W. I'd call this one a bullseye. Hats off to the glider pilots on this one.